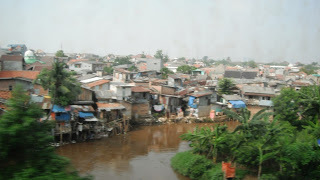 I will be away for the next two weeks, so I thought I’d leave you with a blog post that I wrote in June 2011, when I was on Sabbatical and traveling mostly by train across Indonesia and then from Singapore to Europe. 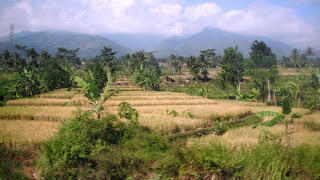 In this post, I am cross the island of Java. The heat and humidity is stifling here. I sweat, even in an air conditioned train, the Taksaka 1 from Jakarta Gambir Station to Yogyakarta. The sun pours through the glass. I could close the curtains, but then I’d not see the countryside, so I sit with sweat beading up on my forehead. The back of my shirt has been soaked for some time and clings to the seat. The train races past vast rice fields, in different stages of production. Although large, each field is divided into manageable plots, separated by dikes allowing for flooding of the paddies. Here, six degrees below the equator, it is endless summer and the fields produce two crops a year. 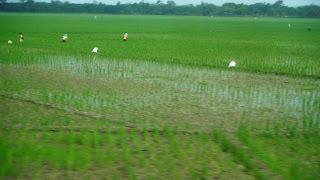 In some paddies, the green rice is tail and I occasionally see a farmer wandering through with a backpacking, spraying what I assume is insecticide. Other fields are muddy, in the process of being cultivated for a new crop. In the paddies that are currently being planted, bundles of rice plants have been placed and workers in six inches of so of water are busy transplanting the young grass into neat rows. In other paddies, they’re harvesting rice, cutting stalks and feeding them into a thresher or, in some cases, beating the stalks on the ground, separating the seed from the grass. And there are paddies in which the harvest has occurred. The stalks in these fields are burnt as they prepare the ground for another crop. The smoke from the burning paddies occasionally waffles through the train. The train was nearly an hour late leaving the capital city. For the longest time, we rolled through the sprawling city, its poverty evident and on display. Trash was everywhere and the canals, which had gagged me when I’d walked across them on bridges, are filthy. In my reserve seat, I watch the crowded trains come into town, the only air conditioning that many enjoy come from climbing up on the top of the cars and riding out in the open. It’s dangerous. If the train hits a bump they might fall off, but they are also in close proximity to the overhead electrical wires. This is a country of great contrast with a few who are very wealthy and many who live in unspeakable conditions. Slowly, we leave the city behind us and moved into the tranquil countryside, with farms and elaborate irrigation systems lining both sides of the tracks. We pass small stations, each with their station master standing out front in his railroad uniform and red and yellow conductor hat, observing us as we speed by. Our first stop is Cirebon. As the train approaches the station, a host of merchants jump onboard the slow moving cars to sell food and drinks and other goods. There are women with a thermos of hot water and cups along with instant packets of coffee and chocolate. Others sell baked and fried goods, fruits, and packaged snacks and chips. These merchants don’t enter the coaches themselves, probably due to regulations as the railroad itself has plenty of their workers already doing that, but they stand at the end of the cars, in the doorways, crying out for their products. Others run down the track, tapping on windows, offering up their wares. On the advice of the older Indonesian gentleman sitting next to me, I order a steak for lunch. 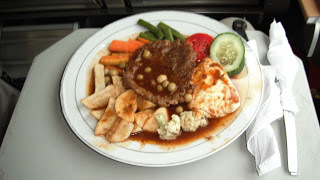 It arrives as we leave Cirebon, a plate consisting of ground steak, some egg, boiled potatoes, carrots and green beans. It all cost 30000 IRD, a little over $3. It’s nothing fancy, but it is filling. I ask my traveling friend where the beef came from (I’d only seen one cow so far and it didn’t look like anything you’d want to eat). He laughed and said it probably came from Australia. 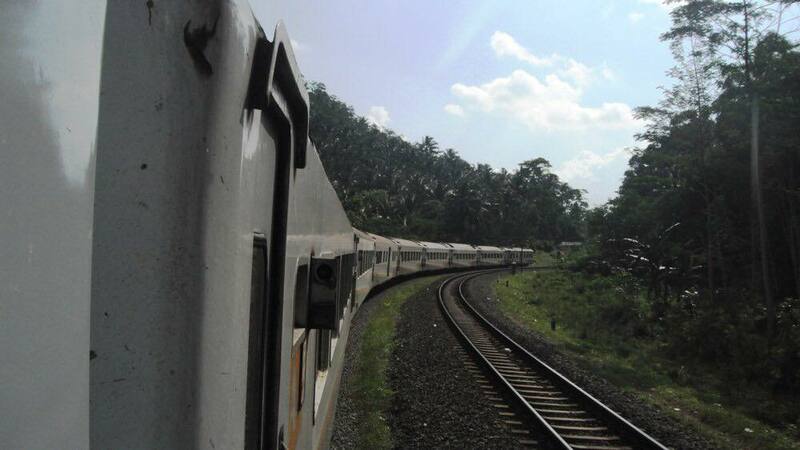 As I finish lunch, the train turns southward and snakes up the ridge of mountains that form the backbone of Java. Rice is still grown and higher up, we see more fields in harvest. But there are many other vegetables grown. Also, there are a few cows along with sheep and goats. I’m impressed by many of the fields, in which the dikes that cut up the rice paddies have a row of string beans staked on top. There are also plots of corn, sugar cane and melons. I am enchanted with the scenery and the neatness of the countryside. The irrigation works are even more elaborate here, the water running through masonry channels. 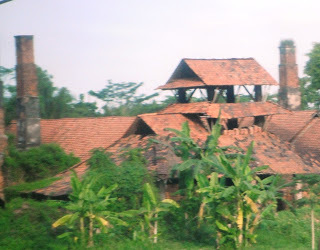 The neat houses, all roofed with red tile, stand in contrast to the green fields and are shaded by tall palm trees, many loaded with coconuts. I walk up to the front of the car and stand by the door, between coaches and try to get a better angle for a shot of the back of the train as we move through the turns. An attendant sees what I’m attempting and opens the door for me, allowing me to stick my camera out and photograph the back end of the train. Although careful, I know that it is dangerous and you’d never be allowed to pull such a stunt in the United States. I remember once standing in such a place where another traveler with a camera opened a window. The car attendant was furious with him! I stay in the doorway for a long time, enjoying the breeze and the ability to photograph without having to shoot through dirty glass. Although the car, with many cracked windows, doesn’t look like what we might expect from “executive class,” I am impressed with the tracks. Here in the steep section of the line, line is mostly double tracked with welded ribbon rail and there appears to be new ballast under the concrete ties. Your writing and pictures make me feel like I’m right there experiencing the trip with you. Nice job! Hope your current excursion goes well. Hope your current trip goes well. 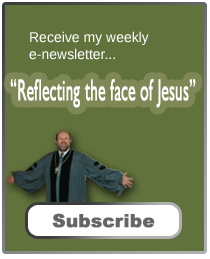 This is fascinating and yes, you make me feel like I’m right there with you! Have a safe journey and I look forward to hearing about where you’ve been once you return. 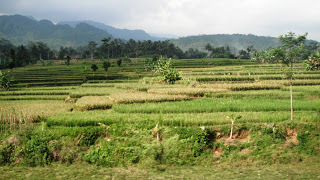 We have large rice fields around here, but I never saw any quite so green and lush. Safe and memorable journeys to you, Sage. I so envy this journey. I love Southeast Asia – would happily spend months, or more, exploring. Thanks for sharing that. The steak lunch didn’t look too bad. Enjoy your hiatus! I love that you go on so many adventures. Someday I want to be financially stable enough to travel. I’ve never left North America. must have been an amazing journey! Sounds like you had a fascinating trip. I enjoyed reading about your travels and seeing your photos. I hope your current time away is treating you well. I have to admit that you’re a brave man. I usually become veggie or vegan when abroad. 🙂 Great tale.